Bali is one of those destinations that can’t be fully experienced on a short vacation. This Indonesian island has been featured as a top travel destination across the world and draws thousands of tourists every year. It is truly difficult to cover the charms of the island in a short visit, however, if you have a week and want to cover the highlights of the island, here is our short and fresh Bali itinerary, which involves a lot more than just visiting the gorgeous beaches! This guide will not only give you a flavor of what Bali has to offer but will surely make you want to visit again for more. Ubud is the natural and cultural hub of Bali. It has numerous sights and a long list of exciting things to explore. In addition to the rice terraces, jungles and the waterfalls of Ubud, you must visit the temples and try out the cultural shows that are famous there. 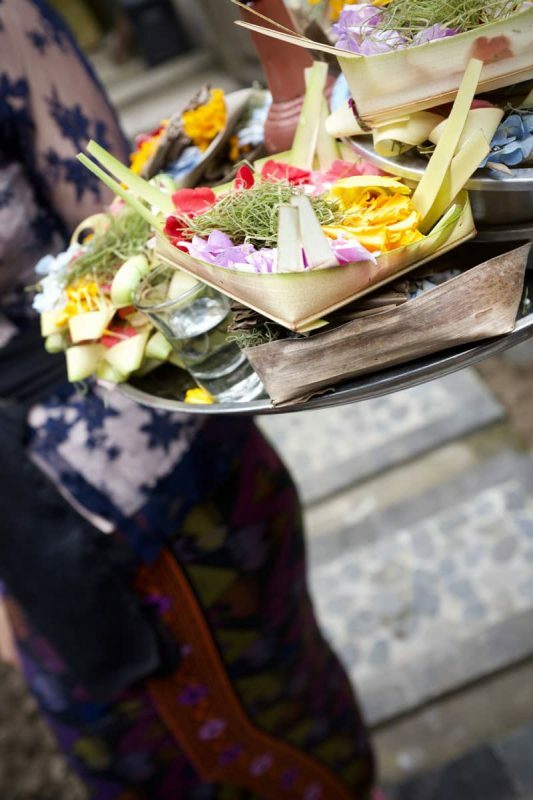 The temples of Ubud, such as Saraswati Temple, Pura Gunung Lebah, and Puri Saren Agung, seem to take you back to ancient times and show you traditional beliefs of centuries ago. You will find most of the temples wrapped in interesting legends and myths that have been passed down the generations. Hiring a local guide to hear these stories as you walk around the temples, is a good idea. The temples are surrounded by trees, forests and water pools that create a surreal ambiance unique to Bali. The town of Ubud is about one and a half hours away from the airport and it acts as a perfect relaxing base after a long flight. 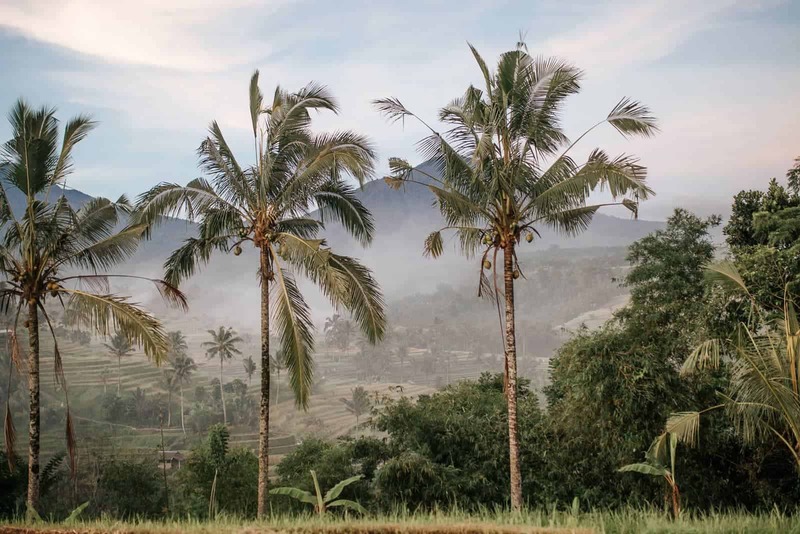 If you want to experience the local side of Bali, choosing a villa or a cottage in any of the Ubud villages, surrounded by paddy fields is ideal. Ubud has a laidback vibe which makes you feel at home right away and the locals in Ubud are very welcoming. Ubud is bustling in town but it’s also very easy to escape into the chilled out serene lush fields that surround the area. 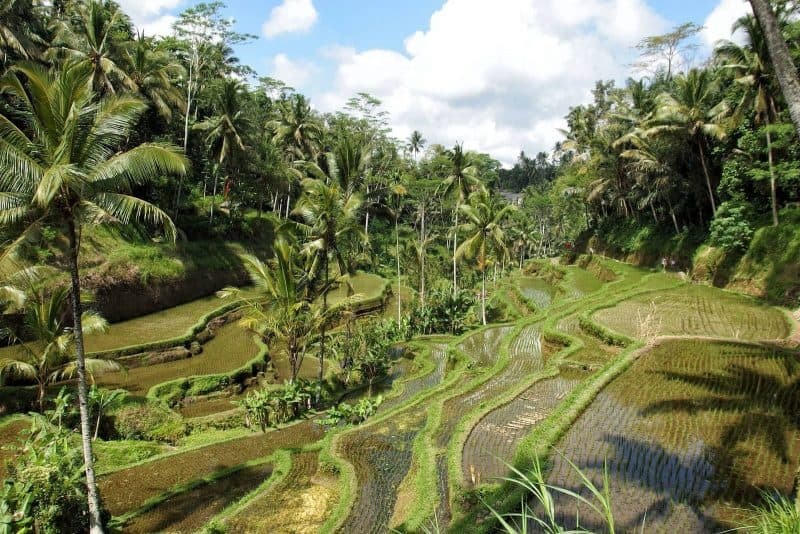 Exploring Ubud will need a bit of planning if you are thinking of squeezing in as many sights as possible during a short stay. 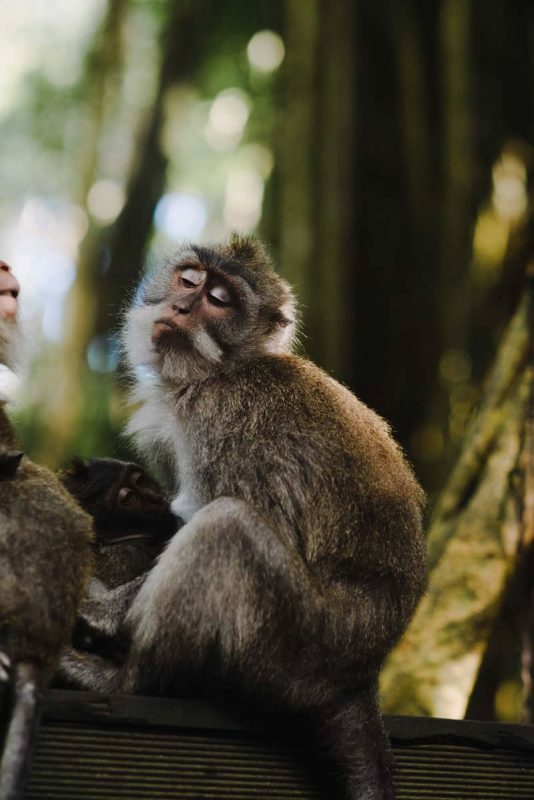 We recommend the Sacred Monkey Forest as the first place to kick off your Bali itinerary if you are a nature lover. The well-known forest is a sacred Balinese Hindu site with three temples. The jungle roads are populated by hundreds of long-tailed monkeys, who are believed to protect the temples from evil spirits as per local beliefs. The best time to visit the temple is early morning, and you must dress conservatively while visiting the temple complex. Do take care of your belongings as the cheeky monkeys tend to grab food items and smaller personal belongings which they will promptly run away with. Not sure what to pack? Read this Southeast Asia packing list so you know what to bring and NOT to bring. About half an hour outside Ubud lies the Tegalalang Rice Terrace, which is a part of the Cultural Landscape of the Bali Province UNESCO World Heritage Site. During peak season, the greenery of the terrace fields is refreshing, and you can trek through them while observing local farmers and skirting by traditional villages. Try to avoid visiting during the day as it can get sweltering and humid. Watching the sunrise or sunset is a favorite activity in this area, and it does get quite busy during these times. Ubud also has a few prominent waterfalls, and most of them can be reached within an hour from the town center. Tegenungan waterfall is the most famous waterfall, and you can hike through the forest to reach the top! Most of the time, you can see local boys jumping off the cliff into the waterfall. Kanto Lampo and Dusun Kuning waterfalls are the more offbeat waterfalls and are mostly skipped on the typical Bali itinerary; however, they are getting more and more popular. Bali is home to a few active volcanoes, and when in Ubud, you can hike up the most beautiful and famous one, Mount Batur, to watch the sunrise. 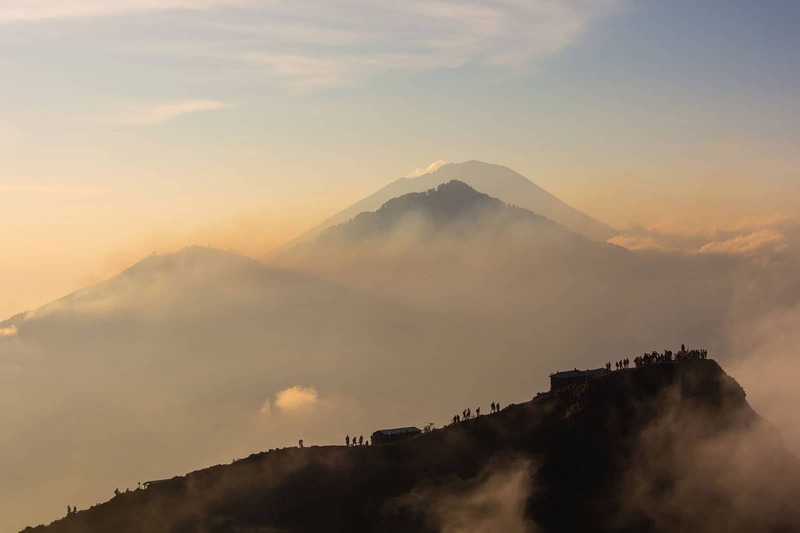 Hiking up Mount Batur will be rewarding although it’s not for everyone. A certain level of fitness will be required to trek up steep switchbacks in the dark (if you’re catching the sunrise, which is definitely recommended! ), and at times, you’ll be navigating the trail close to an edge. Don’t get deterred though, it’s a trip of a lifetime and the views are, of course, worth it. Ubud is also known for yoga, so you’ll find many centers offering courses and traditional Balinese massages and therapies here. The art scene in Ubud is vibrant, and you will find a few emporiums and galleries selling Indonesian artwork at very reasonable rates. The batik items are of special interest and originated in Indonesia. Junjungan Ubud guesthouse has everything you need to ensure an enjoyable stay. Hidden in the palm trees, you can chill by the pool or have a relaxing drink in the garden. If you want to indulge yourself on your Ubud stay, SenS Hotel and Spa is the place to be. The hotel is very close to many popular sights and provides plenty of comforts to get ready for the next day. Next on our Bali itinerary is to explore the coast—what you’ve been waiting for, right?. The southern beaches of the island are most accessible from the airport, and a trip down south is a great way to uncover these gorgeous beaches. The beaches are close to each other and based on your budget you can choose your base. For budget travelers, Kuta beach or Canggu area offers a lot of affordable accommodation and dining options. Nusa Dua is comparatively more expensive with most of the beachfront resorts and five-star hotel featured. Editor’s Note: Kuta is the closest to the airport which makes it very convenient and accessible. However, if you can avoid this area, it would be in your best interest. It’s stuffy, the beach isn’t the greatest, it’s rife with scams, it’s less value for your money, and there are about 100 other places that are more worth it! With that said, if you arrive at Bali late or need to catch an early flight, this is one of the most accessible places to stay. One of the most touristy temples, the Tanah Lot temple is close to these beaches and must be visited for its location. The temple is built on an island and is accessible through a narrow path which gets submerged under water during high tide. The rock formation and the temple structure is iconic and looks spectacular especially during the sunset. Uluwatu temple is perched on top of a cliff, and you can see the traditional Balinese Kecak and Fire dance performed every evening there. Just around the corner at Nusa Dua, you can visit the famous temples, Pura Gegar, and Puja Mandala, take a boat tour to Serangan Island to visit turtles, go snorkeling or diving, and then relax on the lesser-visited Gunung Payung Beach. We recommend adding one day to your Bali itinerary for a road trip taking the offbeat route to cover the island down south. Don’t be surprised if you find yourself all alone on some of the most remote beaches in southern Bali. Close to Nusa Dua beach is Tanjung Sari Inn. A quiet and cozy place in a lovely location with delicious food and excellent service. At Sofitel Bali Nusa Dua Beach Resort, there are plenty of nearby attractions to keep you busy and indoor facilities to keep you relaxed. Padang Padang Breeze is a cute guesthouse with amazing staff and an ideal location near Dreamland beach. Oh, and the delicious food is the cherry on top. Pinkcoco Bali is definitely a top hotel in the area. Colorful interior, amazing views, and tasty food makes for one great stay. If you have time, do include a day trip to the little neighboring island known as Nusa Penida. 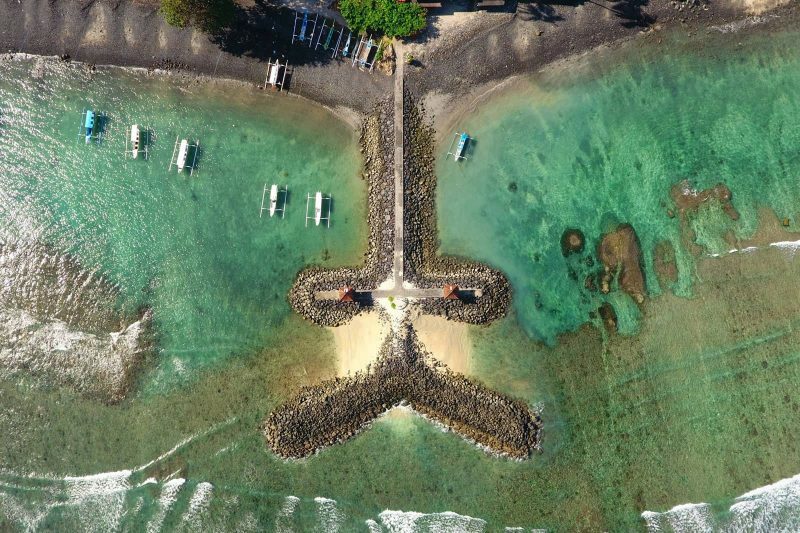 You can get a fast boat from Sanur which takes about half an hour to reach this pristine island. 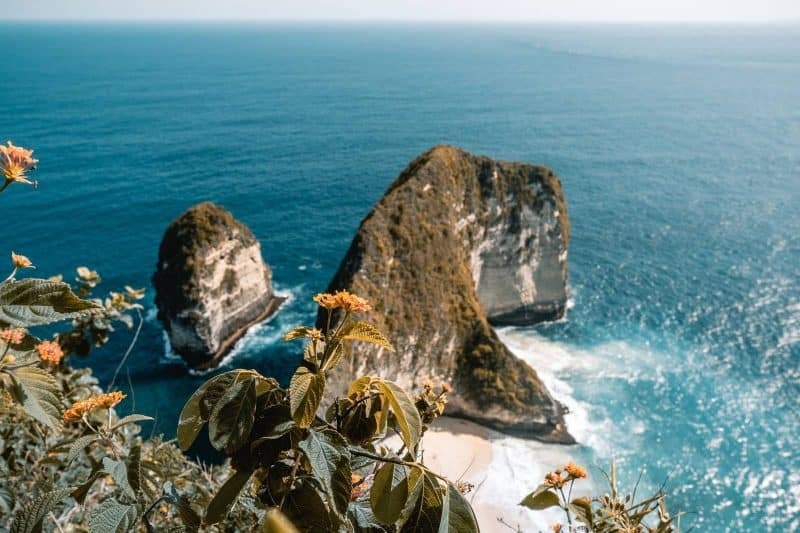 The main sights are along two coasts the East Nusa Penida coast and West Nusa Penida coast, and you can cover the sights either on a bike or by car. The main sights on the eastern side are Thousand Island, Atuh Beach, Cave Temple, Teletubbies Hill, and Peguyangan Waterfall. The west side has Kelingking Beach, Paluang Cliff, Angels Billabong, Broken Beach and Crystal Bay. It is difficult to cover both sides in one day, and we recommend to explore the west side first as it is known to be more abundant in natural beauty and takes less time. Nusa Penida also has resorts and hotels, and you can plan a trip longer than a day to relax and enjoy the island to the fullest. 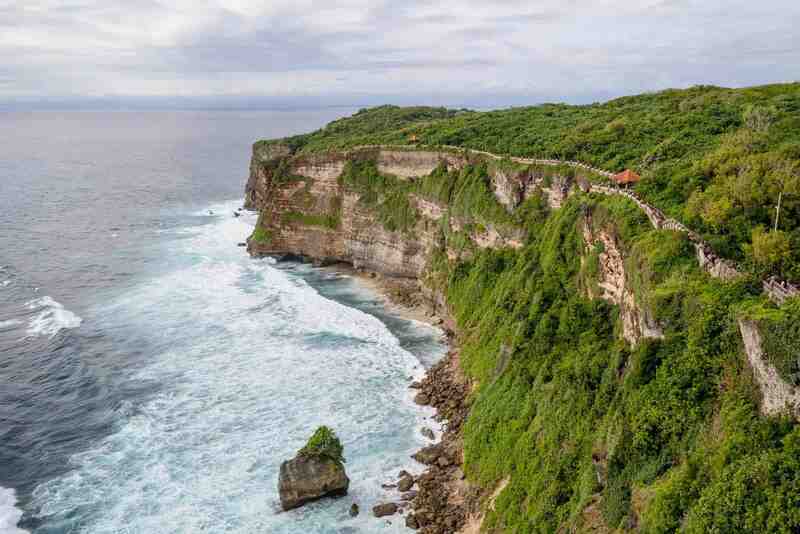 Off the beaten track, explore the forgotten gem of Bali, Candidasa. This part of Bali used to be a leading tourist hotspot during the 1970s, but the increasing urbanization led to the destruction of its coral reef. Once the reef was gone, the golden beaches disappeared leaving the beachfront hotels without any beaches, and the tourist focus shifted. Today, only a part of the shoreline has a narrow beach. But if you are looking for a relaxing vacation, away from the crowds, for less cash, and would love to try out snorkeling and scuba diving, then Candidasa is your place. A unique highlight of this area is the village of Tenganan which is close by and is one of the last communities In Bali which still retains the original inhabitants of the island, an ethnic tribe called Bali Aga. A trip through this village will not only introduce you to the traditions and way of life of this community but will also allow you to buy some of their local artwork. On the way to the village, you can also explore nearby temples like the Bat temple and Water Palace. Amed beach, known for its black sand and just an hour away, is a fascinating diving spot with colorful marine life and shipwrecks to explore. This spot is often skipped but there are some great views both underwater and on land. Ari Home Stay is a top budget option to base during your stay. The beach is moments away while the amenities are just enough to ensure a comfy stay. Beautiful views of the beach are what makes Hotel Genggong one of the best places to stay in Candidasa. Great location, spacious rooms, and comfy beds, what else do you need? Read this backpacking Indonesia post for more tips, scams to avoid, costs, etc! Bali is known to be a fantastic backpacking destination, and you will find accommodations fitting different budgets, all across the island. Living in a homestay or with locals can help bring down the accommodation expenses significantly. Renting a scooter is one of the cheapest ways of getting around the island. If you can manage, eat as locals do and it is a great way to save money on food. International food is generally more expensive. While visiting Bali, don’t forget to bring your bargaining skills as nothing is ever at the value quoted there. Read more about how to plan a trip to Bali within budget here. Will you follow this one week Bali itinerary? When are you going? Let us know in the comments! Pujarini Mitra is a travel writer and Founder at MySoulTravels. She has worked with several major retail and travel companies, and her work has been published internationally. 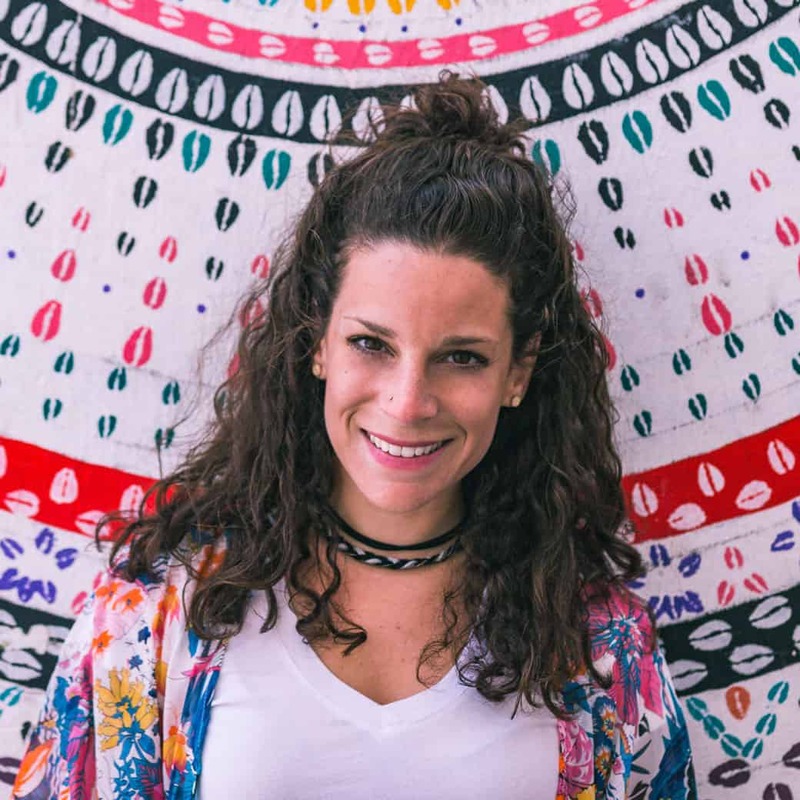 An avid traveler, she loves exploring offbeat destinations and discovering new cultures. Check out her blog and follow her on Facebook, Instagram or Twitter.